I’ve been thinking about something for a while now, as I’ve been seeing a growing trend amongst many running events. Did your eyes get all wide eyed at the thought at more medal madness to add to your collection? As far as I know, Disney brought us the multiple medal first. Earning a treasured Goofy medal for completing the Goofy Challenge (half and full marathons in the same weekend). Disney also incorporated the Coast to Coast challenge which is running two Disney half/full events (one in California, the other Florida) in the same calendar year. 2013 was a big year for Run Disney fans as Disney dangled more shiny new hardware for the taking for the 2014 races.. First they introduced the Dopey Challenge, which enthusiastic runners everywhere (myself included) signed up promptly. For the gals, Disney didn’t disappoint, as they brought in a very special Coast to Coast ‘Pink’ edition for running both Tinker Bell and Princess half marathons and introduced the Glass Slipper Challenge. Of course, that’s Disney. There’s a little something extra special in those coveted medals. Would’nt you agree? So now, I see a trend. Rock n’ Roll series does it. Space Coast is doing it. Even my local Santa 5K race joined in the extra medal fun. Some of these extra medals are earned by running two events in the same weekend series or seasonal series. Rock ‘n’ Roll gives you an extra medal if you run 2 or more of their events in a calendar year. Run 5 at Rock ‘n’ and your a ‘Rock Star’. I always wanted to be a rock star! Space Coast gives you up to 5 years to earn that extra special bling. Run 3 races in 5 years, and you’ve reached the Milky Way. Run 5 races, and well, you’ve gone Intergalactic. Whatever that means! LA/SF Challenge, Boston to Big Sur Challenge, they jumped in too. And although they don’t seem to be giving extra medals, there are commemorative items for running the Five and Dime, or Hat Trick at the Heartbreak Hill Half Marathon series in Boston. I’m no stranger to liking the bling. There was a time when getting a medal signified a mile stone or a notch up my running pole of success. I still remember the first half marathon I participated in and that medal signifies to me, how far I had come as a runner; as well as how far I had to go to be a competent runner. Years have passed and I’ve collected my share of medals, most of which sit in a Walt Disney Bag hanging over a shelf by my computer. They aren’t for show-and-tell. I really don’t have the space to exhibit many of them. These bags of medals do however make a quick grab as they sure do make a really good weapon. (if ever I needed one) Think Bam-Bam with a clankity-clank. Perhaps it’s the next step for those that have done a half or a full marathon and aren’t inclined to make a leap to ultra running. Perhaps these endurance challenges, tackling back-to-back races in the same race weekend is the next logical step. The extra bling is not perhaps the incentive, but it’s the challenge itself. Perhaps if I lived more local to a race such as Space Coast, it would be incentive to register year after year to the same race. They do have some pretty cool looking medals. What do you think? 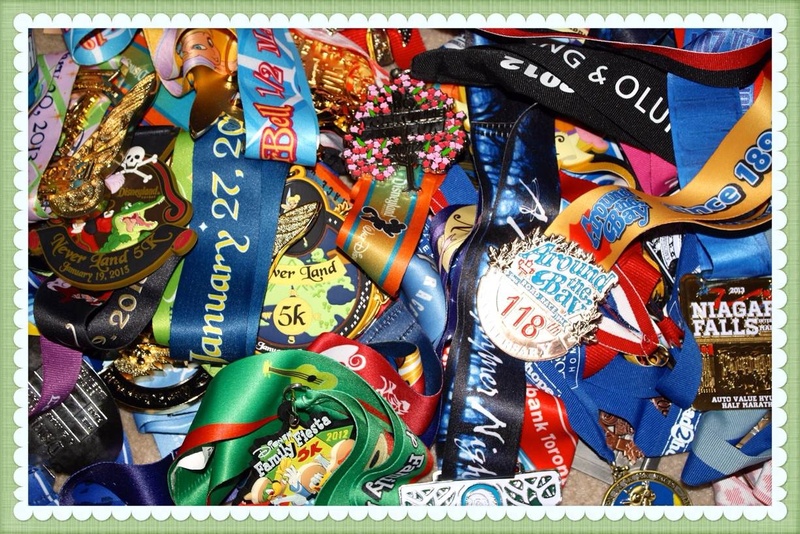 Aside from a Disney event, are you lured by extra medals in other running events? Would you take on an extra event to achieve an extra piece of hardware? According to the website, there are races all over in the U.S. and the one in Toronto. If you are interested in something a little different that a 5K race, check it out! I love the concept of this race. Just looks like a good time all round. I wish I could attend, however, I’m heading to NYC this weekend. I’ve been promised a run in Central park is on the agenda. Woot!